The New Study opens the suite of Paul I's private apartments. It was created, in 1800, by Quarenghi. 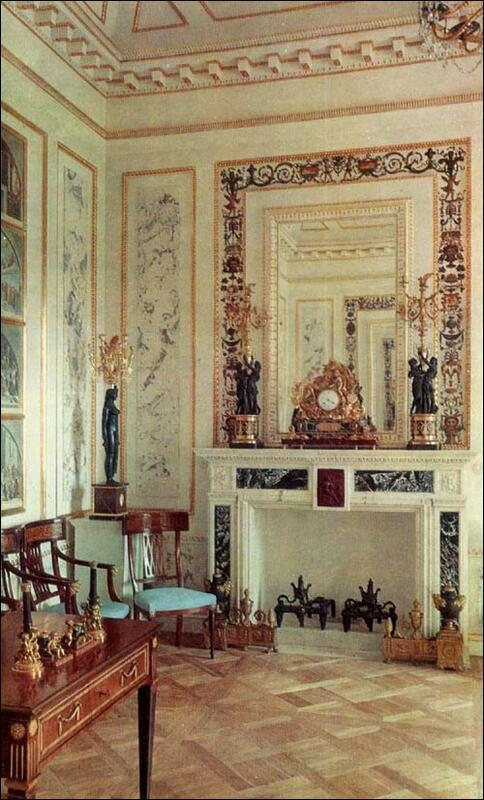 Both intimate and very elegant, the room is an example of Quarenghi's severely classical style. The walls are faced with coloured stucco and ornamented with mirrors and panels of natural white marble painted with grotesques. This decor gives to the room an air of dignity. The exquisite colour scheme is enriched by coloured prints set into the walls. Executed by Giovanni Volpato, they show the frescoes painted by Raphael and his pupils in the stanzas of the Vatican: Parnassus, School of Athens, Fire in the Borgo and other compositions. 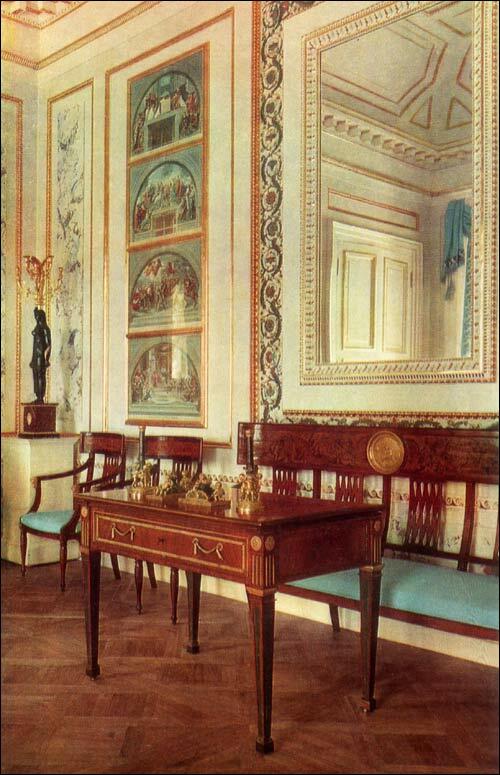 The mahogany furniture with ormolu decorations comes from the workshop of David Roentgen. The cylinder-top desk at the west wall and the writing- and reading-table with a rising top, "at which one can write either sitting or standing", in the words of an old inventory, are interesting examples of furniture decorated with severe simplicity, yet comfortable in construction and well suited for deskwork. On the table stands a writing-set in coloured marble, chased ormolu and patinated bronze. 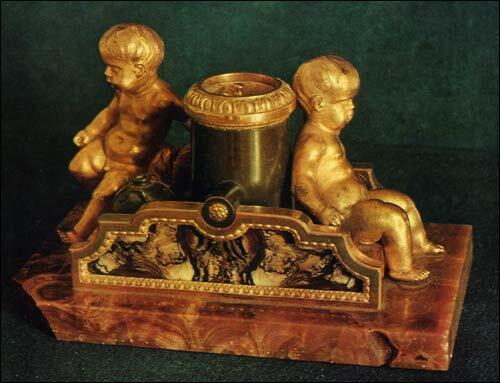 This set composed of an inkstand, a sand box and two candlesticks, each in the form of a cannon or a mortar supported by cupids, was "made from the models by Jean Antoine Houdon originally created by him for the Chesme writing-set which had been ordered by Catherine II to celebrate the brilliant victory at Chesme in 1770. Other first-class specimens of French bronzework are a clock with the figure of a bacchante, a pair of candelabra, and fire-dogs, decorating the fireplace of black and white marble, of eighteenth -century Italian workmanship. Three large blue porcelain vases with gilding and portrait medallions stand on the console table in front of the mirror. They are rare presentation pieces fashioned at the Ludwigsburg factory of the Duke of Wurtemberg. A handsome crystal and blue glass chandelier of late eighteenth-century Russian workmanship completes the decor of the New Study.